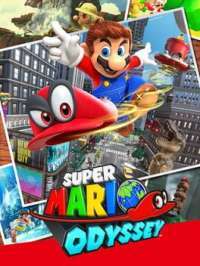 Odd Looking Stone In Mario Odyssey? At the top of Fossil Falls, near the area where there was a boss fight against the fat woman and the chain chomping thing I found this large metal cube. It could also be stone but it was polished and looked quite futuristic compared to the rest of the stone in the area. The hat acknowledged that there was something unusual about the stone, but failed to mention why it was of any significance and what the stone is there for. What do you need to do to interact with the strange stones in Super Mario Odyssey?